Yup, I was on a roll with 2 videos in one day....but nooooo. here is another shortened career for one and the beginning of a new one for yet another. Hence the picture. Want an easy and flavorful salad this Holiday season or any time of year? This Yankee inspired salad is a great entrée as well, but especially suited to prevent you from eating too much turkey or ham during those gut-busting meals with family and friends. Preheat oven to 400-degrees F. Spray an 8 x 8 x 2-inch baking pan with nonstick cooking spray. Stir muffin mix, eggs and milk until combined. Pour into prepared pan and bake 18-20 minutes, or until lightly browned on top and it springs back in the center when touched. Remove from oven to cool completely. Cut cooled cornbread into cubes; set aside. In a large skillet, add 2 tablespoons butter or margarine and melt over medium-high heat. Add green onion, green pepper and julienned tomatoes. Grill, stirring frequently, until softened, about 2-3 minutes. Add the3 cornbread cubes and continue cooking until cornbread is starting to crisp, another 3-4 minutes. Remove from heat and set aside. Prepare Tangy Sausage Dressing. While Dressing is cooking, toss spinach, mushrooms and cornbread mixture in a large salad bowl. Pour Tangy Sausage Dressing into bowl of greens and toss. Evenly divide among serving bowls and serve immediately. Slice sausage links into 1/4-inch slices. Add to a large skillet, over medium heat, and cook until no longer pink in the middle, about 2-3 minutes, turning each slice over. With a slotted spoon, remove cooked sausage to a dish; set aside. Return skillet to heat and add remainder of ingredients. Bring to a boil. stirring to lift up sausage fonds from the bottom of the pan, and let reduce slightly, about 4-5 minutes. Add the sausages back into the skillet, mix well. *Of course you can also simply added chopped, fresh tomatoes on top of salad when serving. I have two new posts I am adding now because I HAVE TO!! While doing my first videos in many months, I had a "friend" that just couldn't keep out of the shots. So what do I do? 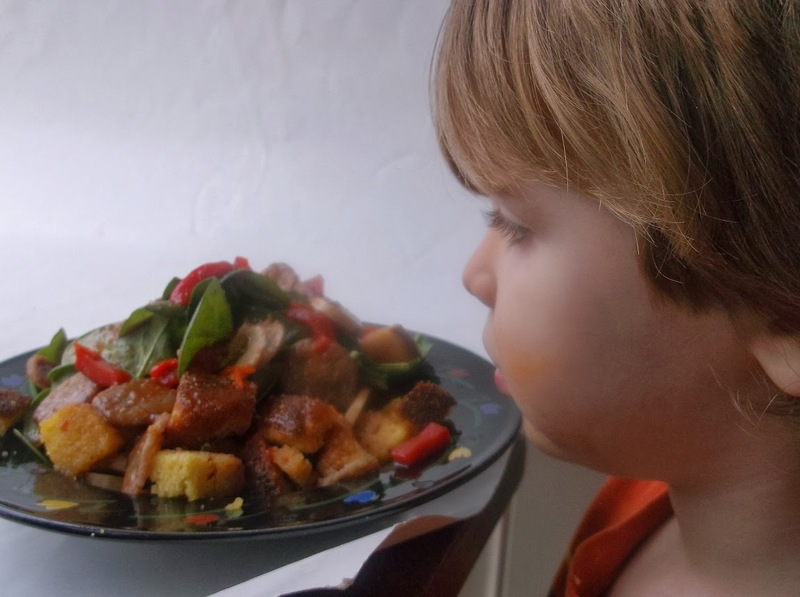 Scrap the videos and use them as a basis for two recipe posts for the Holidays. had fun throughout the day because he was having fun....a Joy indeed!!! You will find the appropriate picture along with these recipe on my site in the next day or two, but enjoy the thought of making this, and enjoying what I went through, I did. 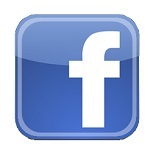 I have given you a decision to make below. 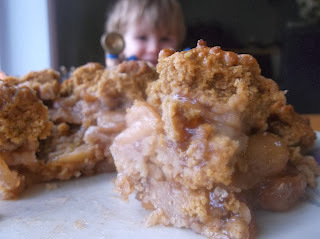 Do you stick with the Yankee version of an Apple Cobbler or spread your wings all the way down south and use pears? Regardless, be assured that the New England taste of home will be quite prevalent with the topping of Gingerbread as opposed to the classic sweetened dough topping. 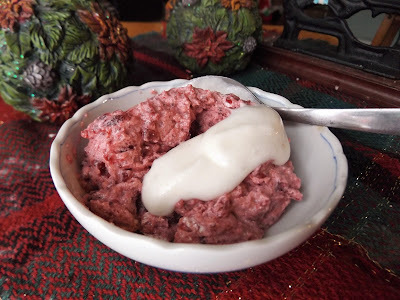 With snow right around the corner and the merriment of the season on its' heels, you will find the aroma of this dessert so enticing, it will be gracing your cozy home into the New Year. Prepare Gingerbread Cobbler Topping. Preheat oven to 350-degrees F. Meanwhile, in a large bowl, combine all filling ingredients well. Transfer to an 8 x 8-inch square baking pan. dollop tablespoons of Gingerbread Cobbler Topping over the top, staggering mounds to represent a cobblestone street. Bake for 40-45 minutes, or until cobbler dough is firm to the touch and a toothpick inserted in the thickest part of the topping comes out fairly clean. Remove from oven to cool slightly before serving. This dessert is best a day old and reheated to enjoy. In a large bowl, combine all dry ingredients well. Add the remainder of ingredients and mix until well incorporated. Set in refrigerator at least 15 minutes. First off, I want to apologize for not contributing to my blog as much as I have in the past. With my new website, I simply haven't had the time to sit back and just plain write on a personal level. I am also not the kind that enjoys talking about myself or even writing on a personal level, but there are more people than I thought that enjoys reading Those types of posts. I titled this post Blameless because it does lead into the theme of this discussion, albeit in a round about way. My Dad, the second Yankee Chef, Jack Bailey(1938-2001) and I talked about so much on our down time. He was the only one I could sit down with and really discuss subjects that were thought provoking and just plain fun. Anything from extra-terrestials to food to love to.....anything really! I remember before he passed he told me that he was glad he wouldn't be around much longer because our country was fast becoming a "blameless society". He was referring to a many different things(we having just had one of those special chats that lasted many hours) but mostly about how more and more people were 'entitled'. If you didn't like the word Christmas, you could easily have it expunged from a schools curriculum. If you walked out into traffic and get hit, YOU could sue and win, regardless if YOU were the one breaking the law in the first place. You could be in a deplorable social condition, but expect the government to take care of your needs without attempting to improve your own life. This list goes on and on, and new laws are being enacted and passed based on these desires, making our world seem as though more and more of our freedom is being taken away every day. And in essence they are, all because of those who declare themselves blameless. I recommend a few things, as did my Dad. If you don't like the word Christmas, you don't have to! The word Christmas is simply a way of people to exude their love of the season and to spread merriment. Regardless if you believe Christ was born and should be celebrated during this time of year, others do. Offended? You shouldn't be offended, because others have joy in their heart! If I believed in any other religion and expressed my joy that conformed to that religion, I would NEVER expect everyone to agree with me, but it certainly would never cause me to bring others down to make myself feel better(and I do believe there is a psychological term for that). Take a look around you and notice those in need. I can tell you first hand that there was a time in my life that is both embarrassing and hurtful. I was homeless, no (or very little) food and just plain distraught. I didn't have the best home even when I worked, at times. BUT...I tried. I always had a great work ethic and I truly tried. There were times that I let liquor rule my actions in the way of truly understanding the meaning of responsibility. All I cared about was partying and having fun. And I suppose it is ingrained when you are younger, regardless of what your parents taught you. BUT.....I never blamed anyone else other than myself. I didn't go around saying "The economy is bad" or "There isn't a job around that pays enough". I preach all the time even today that I would shovel horse&*#% if I had to in order to put food on the table . Those times were MY fault because of MY bad choices, not because of anything or anyone else! You wouldn't believe how many people I have hired over the years that WERE homeless. Heck, I even went to the homeless shelters personally to hire, only to be told no one would work for minimum wage or under a certain amount. There were times when I had to walk to work, ride a bike to work and hitchhike to work(and my father did at his low points in life as well). I have had employees quit after hiring them because they couldn't find a ride to work when they lived a mere mile away. But having said all that, there are families out there that truly need help. What touches me the most is the families that have children. I simply cannot bear the thought of a child going without the necessities of life, even the non-necessities, such as a present, toy or amusement. To me, even those are necessities! To grow means to expand your mind as well, and without the happy thoughts of playing with that special toy while young means just as much as not having a roof over your head. That's why I do things that I never NEVER tell anyone. 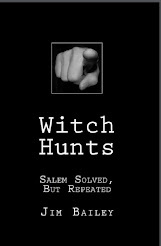 I have no desire to put the emphasis on my book selling or publicity when it comes to helping others. The only time I do so is to increase sales of an item to help raise funds, It's Just That SIMPLE! It's not about me and will never be. And one more thing. I will always believe in the mantra, "If you don't have anything good to say, don't say anything at all!". Certainly opinions can never be controlled, nor should they ever be. But when someone employs their time demeaning others with no cause or spending their time trying to degrade, humiliate or otherwise harm someones integrity or life, I feel bad for them. Shouldn't they focus on doing good and helping others? 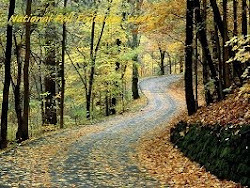 The end result of the former is self-fulfillment in a twisted, ego maniacal way that shows that you think of yourself as "holier-than-thou", while the advantage of the latter is not only helping those in need and feeling good about yourself in a righteous way but it shows others that you have a heart, are level-headed and caring. Let's get our values together and stop thinking of ourselves as BLAMELESS. If you want personal fulfillment, take the lead! There are things you can do that simply shows what kind of person you are. Pick up the phone and call someone you know has a "tough life" and simply talk to them. Get a $5 dollar card from a fast food restaurant and give it out to someone that's homeless. Go to a homeless shelter and offer your time or maybe pick up a few things to drop off at that same shelter. Buy an inexpensive bouquet of flowers to drop off at a nursing home. Ask them to give them to someone whose birthday or special event is at hand. If you are going to the park with your children, call a relative that doesn't have a vehicle but has children, and offer to bring those children along as well. I am imploding with ideas as to how to help those less fortunate but I really can't spend all day telling you. Just stop and think. Do what you think is right and good. And always bear in mind that if you are fortunate to have a good life(and that doesn't mean rich...just have what you need is a good life) there are many that simply can't feed their kids. They can't take them to a park, they can't buy that special stuffed animal for that child or they can't seem to break that cycle. .....—some prefer apples, some onions. 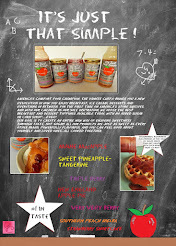 With the Holidays fast approaching, we will be enjoying a variety of flavors and learning as we go along. My favorite chef, Julia Child, once said that she could not imagine a world without onions and I must whole-heartily agree. One of the most intense debates, believe it or not, is the differences between onions. You will see simply the word onion in many recipes and it would be good to bear in mind some of the major differences between these garlic-cousins as we prepare meals fit for family and friends. Onions have been enjoyed, culinarily speaking, as long as they have been used for cure-alls! When cooked in a sweetener(caramelizing), these pungent bulbs have been given as a sore throat remedy and has been said to lessen the effects of the flu right up until the early 20th century. Simply cut an onion into 1/4-inch slices and cook over medium heat with a tablespoon of oil. After 15-20 minutes of stirring and cooking, they will be lightly browned. Now add 2 teaspoons granulated sugar and continue cooking an additional 5 minutes until they are golden brown. I love adding some great balsamic vinaigrette dressing drizzled over the top before adding to a grilled steak. 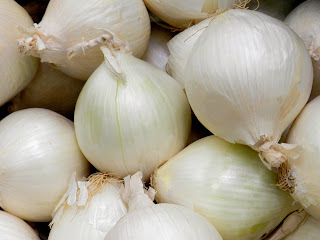 To neutralize the effects of dog bites and as a hair-growing tonic were just two of the benefits of onion juice many farmers relied on during the 18th and 19th century in New England. Backing up a bit though, we find that General Ulysses Grant, commander of those "damned Yankees" during the Civil War, ordered onions to be supplied to his soldiers on the front lines because he believed they would cure dysentery. During this time, digestive disorders and liver ailments were given a reprieve by the housewives of the fighting men through the consumption of onions. And backing up a few hundred years and beyond, the early Chinese added onions to tea for flavor AND overall good health. It was many thousands of years ago that the Egyptians and Israelites enjoyed the taste of 'the bulb', as did ancient Greeks and Romans. . Many folk remedies from days gone by have been shown to be of value lately, with all the research being funded around the world to alleviate illnesses and maladies the natural way. Onions are no exception. 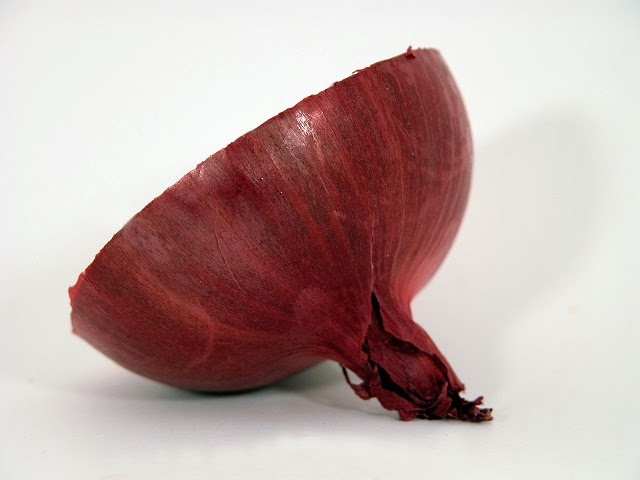 Although it would take the consumption of a small onion a day, they do contain flavonoids. These compounds act as an antioxidant, which are natures way of killing cancer(see my post on Breast Cancer. The most powerful flavonoid found in onions is quercitin. 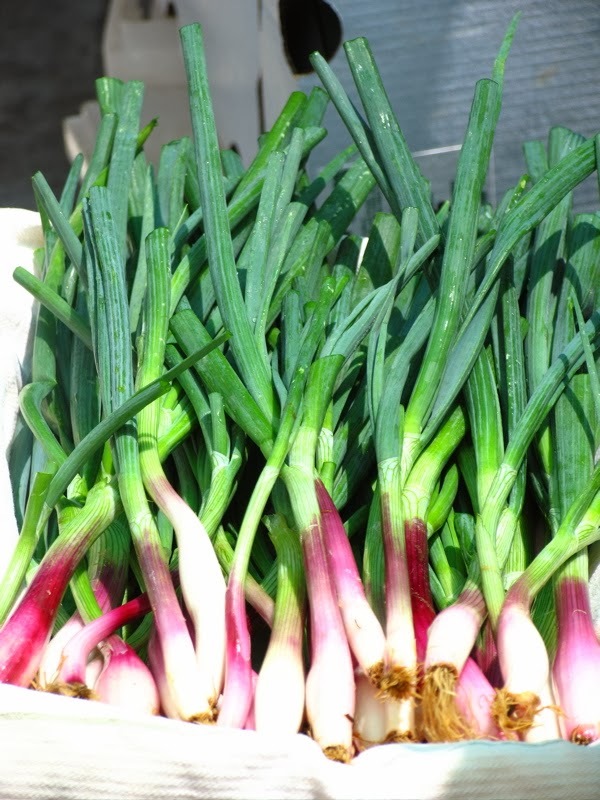 Quercitin is found in shallots, yellow andred onions, but not in white or green onions. This flavonoid has been found to thin the blood, lower cholesterol(while elevating the HDL cholesterol), inhibits stomach caner and is on the front lines when it comes to battling hay fever, asthma, chronic bronchitis, atherosclerosis, many different infections and diabetes. 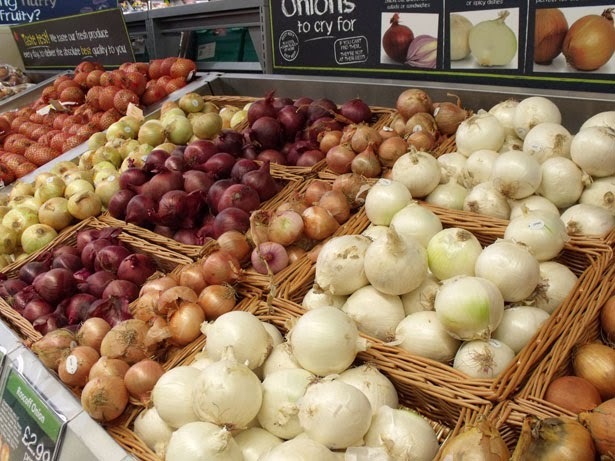 It has also been shown that some prescription drugs have the same effect as onions when controlling diabetes. It works by competing with insulin for the breakdown in the liver, which in turn, increases the life span of insulin. 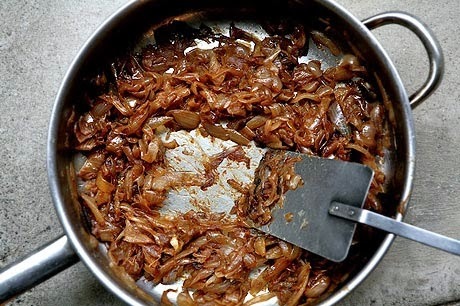 As for the antibacterial properties of onions, there is much written by our ancestors and scientists alike. Onions destroy, I don't mean fight or help fight, but destroy many disease-causing pathogens, including E. coli and salmonella. The also reduce food-borne illnesses caused by microbial contamina, hence its' powerful antibiotic nature. And lastly, but certainly not least, is the heart protection onions give to us. Some studies have shown that onions have surpassed wines' effectiveness when it comes to protecting your heart. Lowering cholesterol, inhibiting hardening of the arteries, help in maintaining blood pressure and aiding in the elasticity of blood vessels are the effects of onions on the healthiness of your heart. These are called cooking onions in the kitchen and are the most common onion in the chefs' repertoire. Used in soups, stews and sauces, yellow onions are perfect for caramelizing. A little milder tasting than yellow, these are often eaten raw on burgers, salads and sandwiches. It is not recommended you cook with red onions because of the lack of pronounced flavor it lends to any given dish that is cooked, but spread them chopped on a hot dog and it is a bite of perfection. Second only to red onions, the mildness of these are used mainly in Mexican recipes and are interchangeable with Bermuda onions. Vidalia, Texas 1015, Maui and Walla Walla are the most popular in this category. Most often eaten raw because of their sweetness, they are only available during the spring and summer for a meager couple of weeks. Make sure you purchase them as you need them, since their shelf-life is much shorter than all other onions. Very high in cancer-fighting flavonoids, these are often eaten raw and are slightly sweet. Known generally as scallions, chives, spring onions and leeks, these green onions have thin white bulbs with green tops. Also known as scallions, chives or leeks, green onions have slender white bulbs and green tops. Used extensively in Asian cooking, they are also great eaten raw. These very small, round white onions are used widely in stews and side dishes because they hold their shape very well in a crock pot and simmering. They are chosen to be pickled above all other onions because of this ability to hold its' shape. . 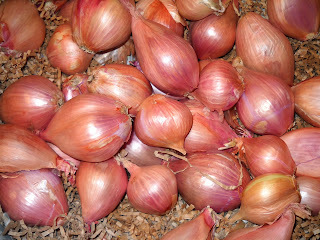 The French use shallots in many dishes and are gaining distinction in fine restaurants everywhere. They have a pinkish skin with a slight garlic flavor and are perfect for sauces and salad dressings. 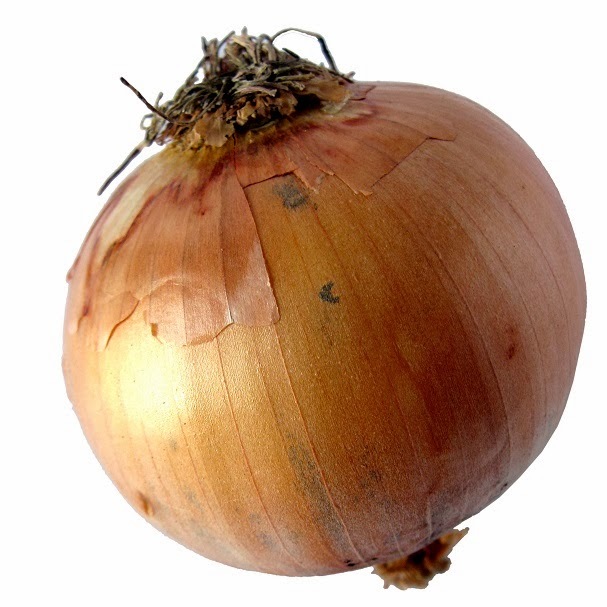 When choosing whichever bulbous onion to use, remember to chose those with no soft spots and minus a strong smell. They are not kept well stores anywhere else than in a cool, dark and well-ventilated area. Do not refrigerate or store in plastic. FYI: What is it that causes your eyes to tear and burn when cutting into a fresh onion? Allinase. This compound is also found in garlic and is a chemical that is present for only one purpose. To prevent herbivores at bay. Once an animal(or human)bites into garlic or an onion, allinase is released, thus causing irritation.